Jean Sibelius, Aallottaret, Op. 73 (two versions), Tapiola, Op. 112, edited by Kari Kilpeläinen with the collaboration of Nors S. Josephson. Jean Sibelius Works I/16 (Wiesbaden, Leipzig, Paris: Breitkopf & Härtel, 2012), xxviii + 198pp. € 144,00. - Jean Sibelius, Lemminkäinen, Op. 22 (early versions), edited by Tuija Wicklund. Jean Sibelius Works I/12a (Wiesbaden, Leipzig, Paris: Breitkopf & Härtel, 2013), xxii + 313pp. € 199,50. 1 Of prime relevance to the scores reviewed here are two Lemminkäinen movements in Lemminkäinen Suite, Op. 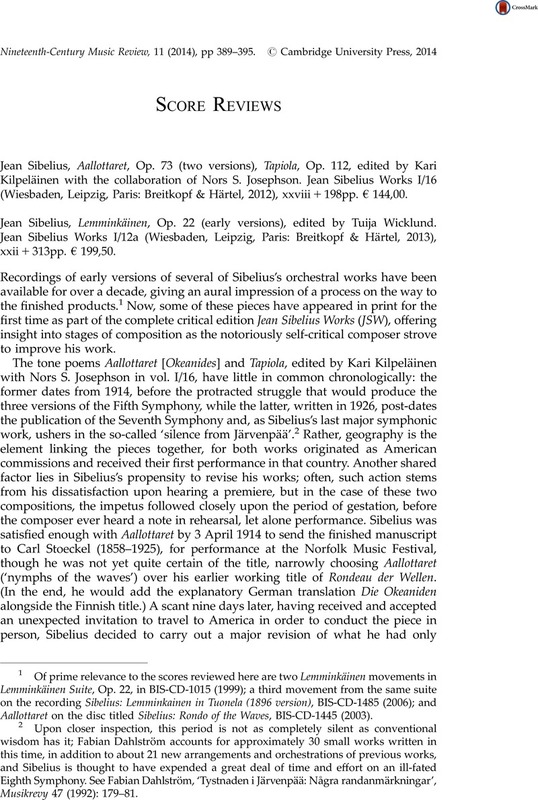 22, in BIS-CD-1015 (1999); a third movement from the same suite on the recording Sibelius: Lemminkainen in Tuonela (1896 version), BIS-CD-1485 (2006); and Aallottaret on the disc titled Sibelius: Rondo of the Waves, BIS-CD-1445 (2003). 2 Upon closer inspection, this period is not as completely silent as conventional wisdom has it; Fabian Dahlström accounts for approximately 30 small works written in this time, in addition to about 21 new arrangements and orchestrations of previous works, and Sibelius is thought to have expended a great deal of time and effort on an ill-fated Eighth Symphony. See Dahlström, Fabian, ‘Tystnaden i Järvenpää: Några randanmärkningar’, Musikrevy 47 (1992): 179–181 . 3 This undated entry lies between 3 and 12 April 1914, in diary, Sibelius's, Dagbok 1909–1944, ed. Fabian Dahlström (Helsinki: Svenska litteratursällskapet i Finland, 2005). 4 For full information, see n. 1 above. 5 Stoeckel, Carl, ‘Some Recollections of the Visit of Sibelius to America in 1914’, Scandinavian Studies 43, no. 1 (Winter 1971): 59 . 6 Barnett, Andrew, ‘Oceanides: The Whole Story’, Finnish Music Quarterly 2003 , no. 3, 46. 7 Barnett, , ‘Oceanides’, 50 . 8 Tuija Wicklund has treated the publication history more thoroughly in the forthcoming companion volume I/12b (2013), the critical edition of the final published versions of all four movements in the Lemminkäinen Suite. 9 Davis, Colin, ‘Sibelius's “Lemminkäinen in Tuonela,”’ in Sibelius in the Old and New World: Aspects of His Music, Its Interpretation, and Reception, ed. by Timothy L. Jackson et al., Interdisziplinäre Studien zur Musik 6 (Frankfurt am Main: Lang, 2010): 271–305 . 10 The title Tuonela joutsen appears in Finnish and Swedish, and also in German and French as part of the texts from first editions of Lemminkäinen listed in the Appendix, but to find an English translation, one must turn to the other volume reviewed here, I/16, which happens to mention the piece in connection with the premiere of Aallottaret (1/16, p. IX).